While Governor of Massachusetts, Romney was so concerned about climate change he ordered a Climate Protection Plan. This is a guest blog from Jane Bright of Healthlink, a local environmental health citizens group in Salem, Massachusetts. Crossposted from Greenpeace Blogs. So Romney’s only current "climate plan” is to attack the Obama EPA and its efforts to cut global warming pollution from power plants and other sources. Just eight years ago, in 2004, Romney was so concerned about climate change that he implemented a comprehensive “Massachusetts Climate Protection Plan”. Then-Governor Romney summarized the issue as effectively as any statement I’ve read, evoking stewardship, science and risk. What the heck happened? He was threatened by the hard right. Rush Limbaugh and others said he was 'unelectable' if he was a climate change believer. In fact, after Romney addressed global warming as a reality in 2011, Rush said "bye bye nomination." For people in Massachusetts and other states this is serious. Superstorms like Hurricane Sandy, sea-level rise and other climate impacts have great consequences for the state. For me, this is very personal. My picture and story were included in the state published report that launched the Massachusetts Climate Protection Plan. During Romney’s governorship, I was recognized by the state for my volunteer work to reduce air pollution in Massachusetts battling a coal fired power plant in Salem. Our effort supported an aggressive statewide commitment to address climate change and was part of a successful regional multi-state program using financial incentives to help power plants cut carbon emissions, a strong model for national climate protection strategies during the Bush years. As soon as Romney decided to run for president, even while he was still Governor, he stopped supporting carbon pollution reductions and started ridiculing climate change as an issue. Climate Romesia? Those of us who have watched him over the decades don’t know who he is or what he stands for anymore. He clearly is not the 2004 version of Mitt Romney. What would a Romney presidency reveal? No one, probably including Romney, knows where he would stand on too many issues critical to the American economy, our environment and our safety. Those of us in Massachusetts concerned about the environment are shaking our heads. We only hope the rest of the nation is paying attention, too. Jane Bright is on the board of HealthLink, a grassroots citizen group dedicated to improving health by reducing or eliminating toxins and pollutants from our environment through research, education and community action. She partnered with Governor Romney’s administration to toughen emissions regulations in Massachusetts. Written by David Pomerantz, crossposted from Greenpeace blogs. Meet Hurricane Sandy, brought to you by global warming. That's a tough message to swallow right now. It means that the devastating scenes we are seeing from the Northeast are not a freak coincidence, but a reflection of our new reality on a hotter, less stable planet, and a reality that will get much worse if we don't do something about it. Fortunately there are things we can do, both to better prepare ourselves for more extreme weather events like Sandy, and to slow down the global warming at their root. But whatever we do won't matter until our politicians start getting honest about the problem. “There has been a series of extreme weather incidents. That is not a political statement. That is a factual statement. Anyone who says there’s not a dramatic change in weather patterns, I think is denying reality ... I said to the president kiddingly the other day we have a 100-year flood every two years now." Clinton gets the facts slightly wrong in his scathing take-down of Gov. Romney (he made his "rising seas" joke at the RNC, not in a debate) but his point stands that Romney's campaign has completely ignored the looming thread of climate change, and even flirted with denying it. Perhaps even worse than Romney's joke that Clinton mentioned - one that is likely to become infamous in the post-Sandy world - is the fact that Romney's budget proposal would cut FEMA funding by 40 %. That's not exactly a smart resilience policy for a hotter planet with more extreme weather events. Despite President Clinton's praise, President Obama has also been mostly silent on the climate discussion for some time. While Obama has made strides on clean energy in his presidency, he has run a campaign almost entirely devoid of any mentions of climate change, instead trying to out-embrace Gov. Romney for who could better endear himself to the fossil fuel industry responsible for the problem in the first place. It may feel funny to talk about politicians right now, but if we are serious about steeling ourselves for the next disaster and slowing down the global warming that's putting these hurricanes on steroids, then part of picking up the pieces means finding out which politicians we can trust to be honest about what's exacerbating these disasters. That starts with the next president. Pres. Obama and Gov. Romney will likely both be talking about Sandy this week: it's a good chance for them to show they'll be one of the politicians who gets it. Aerial views of damage caused by Hurricane Sandy along the New Jersey coast on October 30, 2012. Call Hurricane Sandy a freak storm. Or call it what it is-climate change. Written by Cassady Sharp, crossposted from Greenpeace blogs. Climate change is now changing the weather. All weather events are affected by climate change because the environment in which they occur is warmer and moister than it used to be . The past few years have been marked by unusually severe extreme weather characteristic of climate change . Hurricane Sandy grew to record size as it headed north eastwards along the US coast. Less than 48 hours before it was due to make landfall Sandy's tropical storm-force winds extended north eastwards 520 miles from the centre. Since records of storm size began in 1988, only one tropical storm or hurricane has been larger--Tropical Storm Olga of 2001  . New York and New Jersey suffer the brunt of the damage and New York Governor Andrew Cuomo has certainly noticed the pattern in his state giving the below statement in press conference today. "There has been a series of extreme weather incidents. That is not a political statement. That is a factual statement. Anyone who says there’s not a dramatic change in weather patterns, I think is denying reality." September 2012 saw the second highest global ocean temperatures on record. During the same month, ocean temperatures off the mid-Atlantic coast were 1.3°C above average. These unusually warm ocean temperatures have carried on into October, enabling Sandy to pull more energy from the ocean than a typical October hurricane. Hurricane Sandy could have been just some coincidental freak storm. A rare occurrence with impacts few infrastructures are prepared to handle. The same coincidence that caused the East Coast derecho this summer or the simultaneous Midwest drought. But aren't coincidences and freak storms supposed to be rare? 2012 has been packed with extreme weather, and the aftermath of these events has been devastating not only to individuals, but to the operation of our country. Although mum's been the word on climate change during this year's election overshadowed by a debate on which candidate is a better friend to coal, the issue is now at the feet of President Obama and Governor Romney. The latest reports claim Hurricane Sandy caused 16 U.S. deaths, 7 million without power and $10 billion in damages. 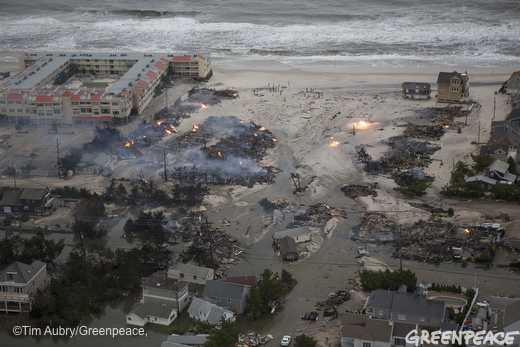 That could make Hurricane Sandy the costliest natural disaster in U.S. history. What would Hurricane Sandy be beating out for that prestigious title? Hurricane Katrina whose devastation was so grave, it nearly led to the condemning of one of America's greatest cities. Our country cannot afford the impact of climate change any longer. The global scientific consensus makes it clear that the burning of fossil fuels is driving climate change and its impacts. It is up to our leaders in government and business to protect us from this growing threat. President Obama and Mitt Romney must articulate the scale of the global warming problem to the American public, and offer real plans to not only enhance US preparedness for extreme weather caused by climate change, but also to dramatically reduce the fossil-fuel emissions that are driving the worst effects of catastrophic climate change. American citizens are paying for climate change when they're left to clean up the mess after extreme weather events such as Hurricane Sandy. President Obama and Governor Romney have indicated a willingness to address taxpayer subsidies to the fossil fuel companies that are driving climate change. Both candidates should commit to prioritizing an end to these subsidies in the first days of their administration. And we can all take part in an energy revolution.